This meatless Monday post comes complete with crappy photos and not a lot of content! Hurrah! All you ever wanted in a blog post. In all seriousness though, it’s tasty and so simple, if a little time consuming. Fava beans (or broad beans in the UK) are super good for you and they’re even more filling than regular beans because they contain tons of dietary fiber. They’re similar in consistency to lima beans or the inside of a chestnut – kind of starchy and squidgy. As mentioned in my Piacere restaurant review, fava beans have a chemical called levodopa which can help with the symptoms of, or even to prevent, Parkinsons if eaten regularly (but talk to a doctor before you start to munch too many of these little green gems). 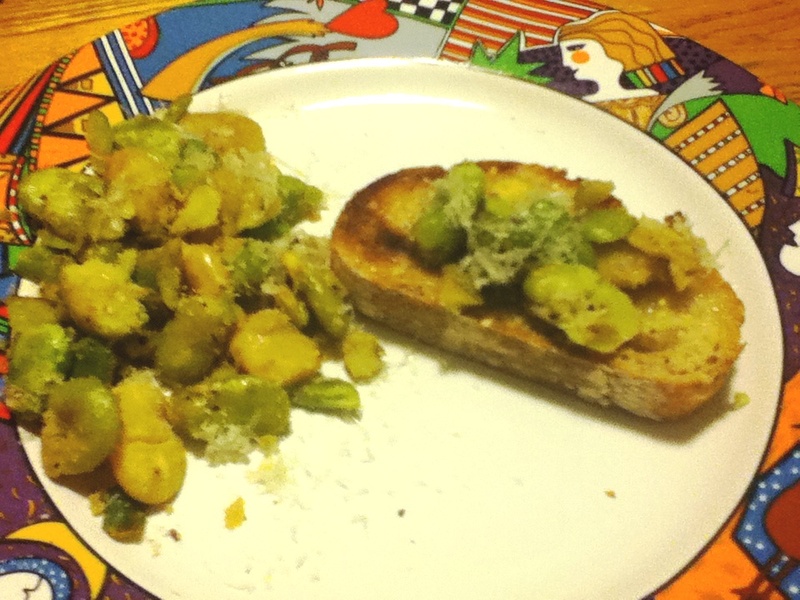 We enjoyed our fava beans gently sauteed with a mixture of olive oil and butter, garlic, salt and pepper and a squeeze of lemon. We piled these high on toast and sprinkled with Parmesan cheese, but by all means leave this (and the butter) out if you are going for a vegan dinner. They would probably taste even better with a bit of mint finely shredded through and a sprinkling of goat’s cheese instead of Parmesan. If you can get already shelled fava beans, by all means DO IT! The task of taking them out of the pod took about ten years, then you have to blanch them and take them out of their tough shells which will take you another ten years. By the time you get around to eating them you’re old, haggard and gray, but on the plus side these little babies will keep your motor functions running smoothly in your dotage! I’m sure there is a difference in taste in home-grown vs frozen, but just eat them. If you must, employ some small children to de-pod and de-shell them for you for a penny a bean! Although, I have to say that when you’re the one that’s done all the hard graft, that self-satisfaction tastes pretty good. Bon appetit (without the meat)! 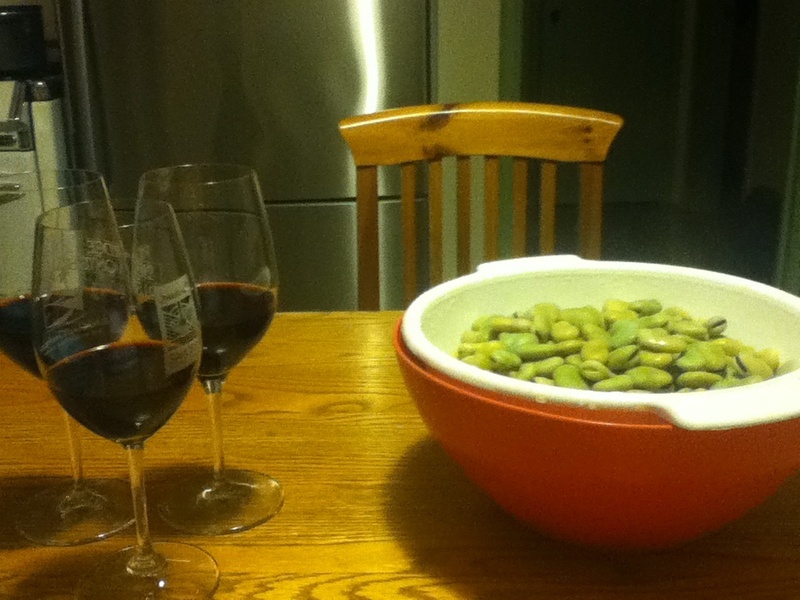 Great recipe, although I can’t help thinking of Hannibal when I hear about fava beans! Haha, my aunt said the same thing! Don’t eat them with Chianti! With wine – even without meat – how can you go wrong?? You can’t! My next Meatless Monday post may not include any food at all, just wine!